Here are two free sample pages from the My School Handwriting Packet. No matter what type of handwriting instruction methodology you are using, children need practice sessions to improve their handwriting. These handwriting pages provide some simple copy work with back to school themed words and sentences. You can print them full page or half page. This is a great no-prep activity to determine a baseline handwriting sample at the start of the school year. Download the two free sample pages from the My School Handwriting Packet. You can get more details on the complete My School Handwriting Packet here. 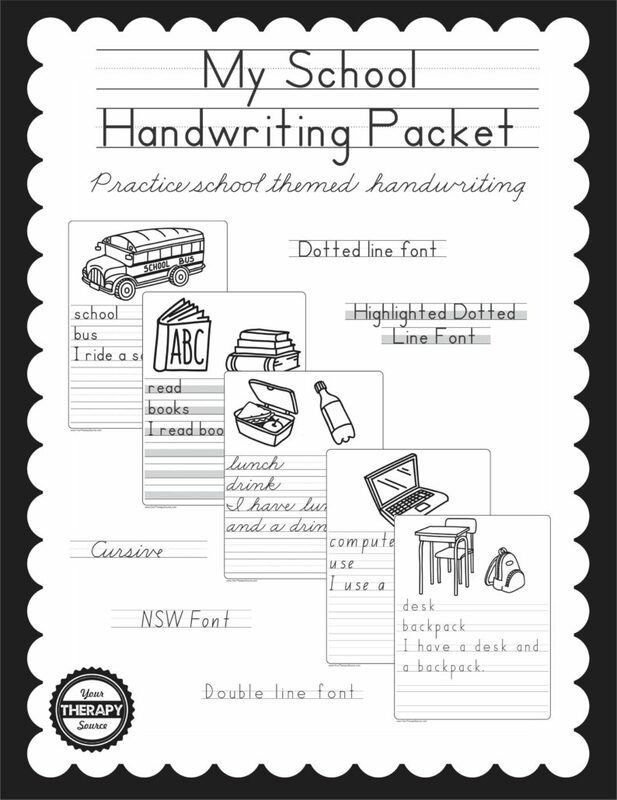 This copy booklet is easy to encourage handwriting practice. The five types of font/layout include: 1. Dotted line Zaner-Bloser® type font, 2. Dotted line Zaner-Bloser® type font with highlighted lines 3. Double line Handwriting Without Tears® type font, 4. New South Wales (NSW) Foundation Manuscript and 5. Cursive font. FIND OUT MORE INFO.